You might be wondering why I used bliss and bayanihan in one sentence. But before we can go on any further, let us define these words separately. Bayanihan - refers to the spirit of communal unity, work and cooperation to achieve a particular goal. Based on their meanings, isn't it safe to say that being helped by your "kababayans" (fellow men) at times when you need it most can bring you great joy? Harnessing the power of crowdsourcing, BLISS gathers insights directly from consumers by asking Filipinos about their current state and their outlook for the future. Responses will be collected primarily via Facebook. 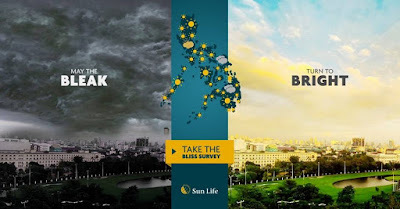 BLISS will also radiate warmth in real life, as the Sun Life Foundation pledges to match survey responses with a donation to help localities with bleak outlooks, as indicated by the stormy icons in the results map. 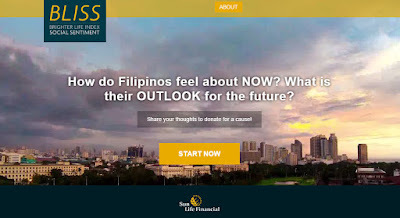 Inspired by the practice of bayanihan (communal work), the initiative translates insight to action, via the information that will be shared by online users. “From BLISS, we lay down the blueprint of #LiveFreePH – to practice foresight by being conscious of our needs while sharing the benefits of living the brighter life,” Lopa said. “We hope that by working together towards financial freedom, we can create a story of a prosperous and optimistic nation, because in our journey to financial freedom, we can go far if we go together.”Share the BLISS to help communities in need and the chance to win awesome prizes like an iPad Air. 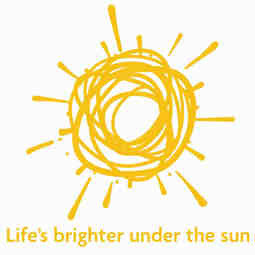 Go to http://bit.ly/1hDBxhn to begin.